This year we weren't too hopeful of seeing anything as it's early in April, there's a war on and we didn't leave Vegas until 0530 thus arrival at Tikaboo was 0730-0800. There is only a little snow and the climb was straightforward enough. Some of the rock cairns have been replaced by yellow tape since our previous visit in April 2001. The biggest factor was the cold; it was 3C (37F) at the base of the mountain, so with windchill from the strong wind at the top the best advice is to take double the amount of thermal wear that you think you need! Having reached the top, we were amazed to find the base a hive of activity (compared to previous visits anyhow) leading us to joke that perhaps they were having a families day as from 0845-1300 it was non-stop action, albeit at bins/scope-straining range much of the time. 0900 Large fighter departs to the south, stays low in the valley then pops up doing the occasional roll. I say large as it was easily visible on departure which surprised me as Janet 737s aren't exactly big at 20-odd miles range. 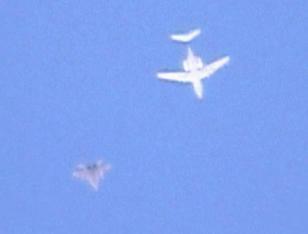 0910 F-16 observed flying high right overhead Tikaboo. 0915-1030 we work out that the large fighter appears to be a Su-27 type and while it performs mainly at low level in the valleys to the South of Groom Lake the F-16 stays high and more to the east. The 'Su-27' is painted in that rather fetching blue-ish colour. Su-27 lands first followed by F-16. Judging by hangar door opening and closing the Su-27 is put away in the front right of the 'Red Hat' hangars. 1000-1100 Blackhawk callsign Cowboy 30 with refuelling probe airborne over the base and incessant chatter leads the scanner to find it. Amused to find that a bit of scanner knob-twiddling gets transmissions in the clear - tx and rx freqs shifted slightly. TWR on 371.025 and a/c on 371.100 but no channel hopping or encryption evident. 1045-1200 a MiG-29 appears in formation with a bizjet. They fly racetrack patterns at medium level. A F-16 appears briefly close to the pair then goes higher and on occasion dispenses flares when close to the pair. The F-16 operates generally to the east of Groom, largely N-S overhead Tikaboo while the pair stay west of Tikaboo. The bizjet is a Gulfstream II and has 2? pylon things under each wing and a chin bump. 1140 Janet 737 lands callsign Eagle 12. I read somewhere that the Janets change callsign (e.g. from Janet 281 used at Vegas)on contact with Groom but hadn't actually heard this before due lack of traffic. 1200 MiG-29 callsign Cowboy 18 lands first. Tower says 'nice chute'. F-16 callsign Cowboy 61 is following it in but tells the tower that (something) has hung, doesn't declare a full emergency but goes round for another 5nm straight in approach and lands safely. No obvious Red Hat hangar door opening/closing follows so one assumes the MiG is put away in a different location to the Su-27. 1210 the Gulftream II chase plane callsign Cowboy 03 lands. 1305 Janet 737 Eagle 12 (again?) departs. Shortly afterwards we came down off the mountain.